What you don’t see or know about your building operation can cost you. We’ve found countless times, in virtually every building type, equipment or control system operations gone awry. Sometimes problems can’t be solved relying on data analysis. Today we’re going under the hood of a grocery store’s building management system (BMS) to reveal what no computer screen ever could. Large buildings typically have a BMS, a computerized control system that can control mechanical and electrical equipment like ventilation, lighting, refrigeration and more. In this case, we were in a grocery store investigating an issue with its BMS. It was programmed to schedule the fan but instead of operating according to the schedule, it was on 24/7. 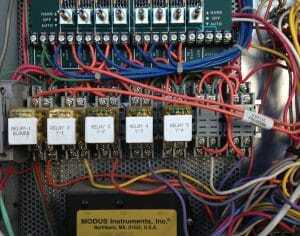 Here’s a look inside the control board inside the unit. This is the part that receives the signal from the BMS. You can see there are five relays. Each relay is a control point that turns equipment on or off based on a signal from the BMS. If you look closely, you see the last two relays are jumpered. So, no matter what signal is sent by the BMS, the system will not respond to the BMS command. Looking at the display screen for the BMS logic revealed the intended, correct fan programming. Since there was no control point for the fan to receive the on/off signal, the fan remained on continuously. Another close look reveals a problematic switch position. The silver switch above the jumped relays is in the ‘HAND’ position instead of ‘AUTO’ like the rest. This simple difference in switch position renders the BMS useless. Instead of the fan receiving control signals from the BMS, the ‘HAND’ position overrides it, resulting in constant operation. It will still appear on-screen as though it was receiving a normal operation signal from the BMS. You can see both issues circled in the same picture below. Sometimes technicians use this trick to bypass alarms from the BMS as a result of alarm fatigue. They get relief from frequent alarms, but their building’s energy use remains higher than necessary, and business owners pay the price. If no one looks beyond the BMS control screen, this type of issue can remain in operation indefinitely. There’s no substitute for functional testing to solve problems like these. When we perform functional testing, we send the command. Then we walk up to the unit and determine if the desired outcome occurred. If not, we dig into the controls and find where it has been bypassed. Functional testing is an essential skill for troubleshooting building operation. The more controls you have the more this type of issue can arise. It is to your benefit to hire consultants with this skill-set since relying solely on analytics won’t solve your problems. Analytics is based on data from the BMS, masking any mechanical control overrides. Unless there is feedback from the unit to the BMS you are simply analyzing the BMS, not necessarily the device. This is why it is essential to focus on the device and perform functional testing. Walking around a building, getting on roofs and troubleshooting equipment is good for solving problems as well as for getting some exercise. It’s critical to get hands-on into operations for these under the hood issues to be resolved. Having knowledgeable and trusted staff or technical assistance vested in the long-term, optimization of your building is essential to solving these undetected problems. If you’re in need of some assistance to dig into your building’s energy use and operation, contact us anytime. An Important Note on Safety…Don’t Try This at Home. 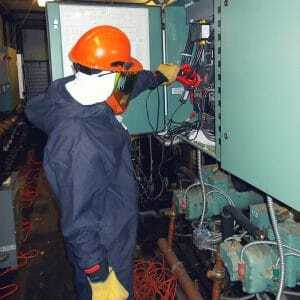 Being around and in contact of electrical panels with live line voltage requires following careful safety precautions. As energy engineers we are trained according to regulatory requirements during our regular, in-depth electrical safety trainings on the proper procedures for investigating and monitoring building energy use and operation. As such, we always use personal protective equipment (PPE). PPE. Don’t leave home without it. Read more on saving energy in grocery stores.